The Sunday afternoon is sweltering with an almost oppressive heat. 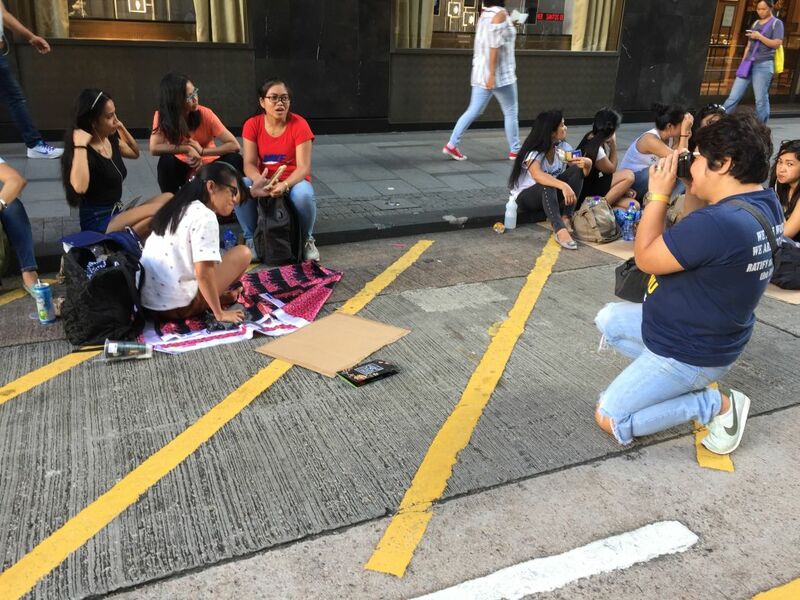 Loryjean Yungco is exchanging jokes with friends in her native Tagalog at Chater Road, Central, where hundreds of domestic workers have gathered on their only day off. Below the skyscrapers, the streets of the central business district have been pedestrianised by the migrant workers, and nearby some women are enthusiastically dancing in what Yungco says is a beauty pageant show. Yungco is all smiles and gently pats her pouch, where her camera is stored. But just hours ago, Yungco was marching alongside angry migrant worker activists rallying over comments a lawmaker made about domestic workers in public spaces. Loryjean Yungco. 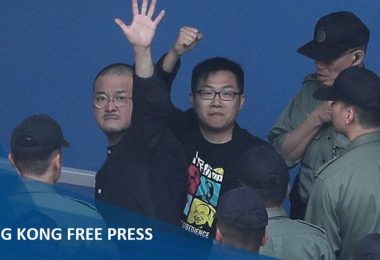 Photo: Karen Cheung/HKFP. From the domestic worker march last Sunday. Photo: Loryjean Yungco. 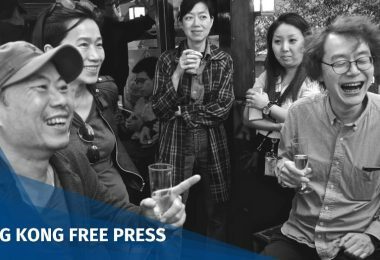 And thus, on the last Sunday of May, rather than feasting on snacks prepared by their friends or resting on the grassy lawns of Tamar, a group of domestic workers instead headed to the party’s headquarters in Wanchai to demand an apology from Yung. She eventually apologised in a public statement on Facebook later that week. Loryjean Yungco was not merely a participant of the protest; she was also busy snapping away for photos which could later be sent out in press releases to the media. 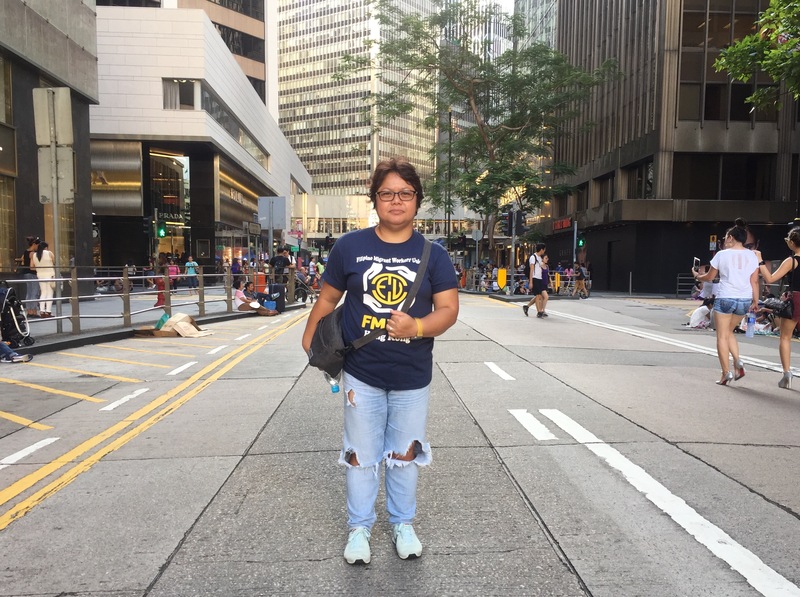 A domestic worker on weekdays, Yungco moonlights as a photographer every weekend, documenting the vibrant migrant worker activism scene in Hong Kong. Migrants Pride Parade in 2017. Photo: Loryjean Yungco. 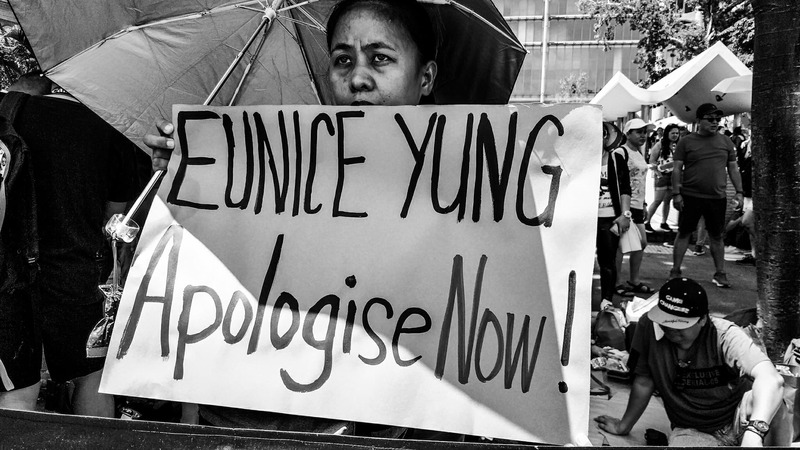 Many learn of the experiences of Hong Kong’s domestic workers from harrowing incidents that make local and international headlines – for instance, the case of Erwiana Sulistyaningsih, who was repeatedly and brutally assaulted by her boss. Legal challenges also shed light on the unfair policies they are subjected to – such as when the top court ruled in 2013 that domestic workers could not gain permanent residency in the city regardless of how long they have lived here. Recently, a domestic worker also failed in her bid to overturn the live-in rule that requires them to reside with their employers. Through Yungco’s lens, however, domestic workers are not victims of a harsh, unfair system – they are fiery and spirited fighters, taking fate into their own hands. 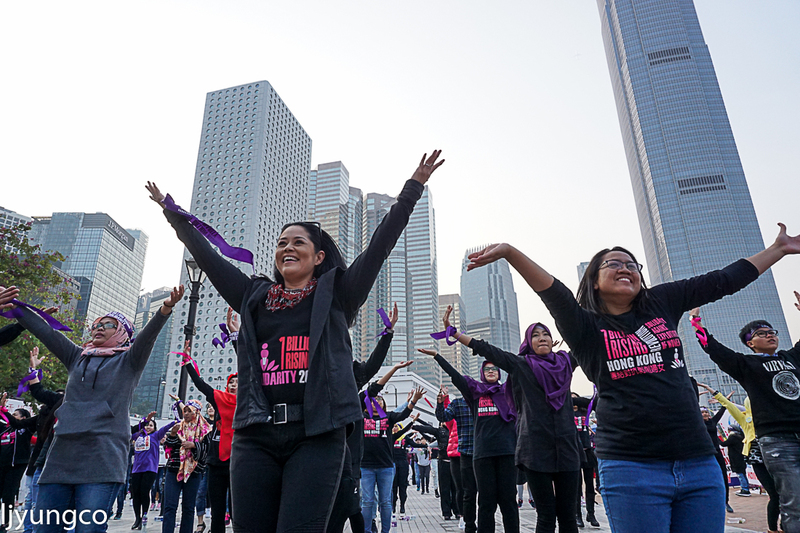 One Billion Rising in 2018. Photo: Loryjean Yungco. 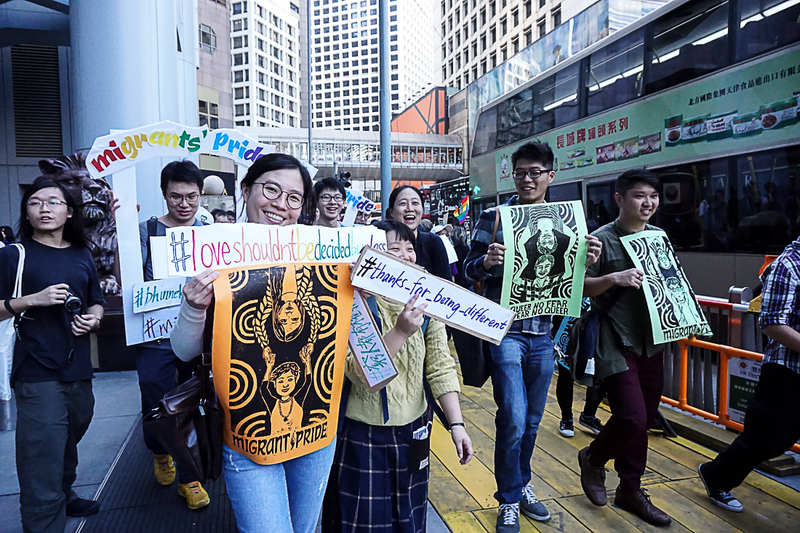 Because of local labour laws, employers are forbidden from firing workers for unionising, and migrant worker groups are amongst the strongest unions in Hong Kong. 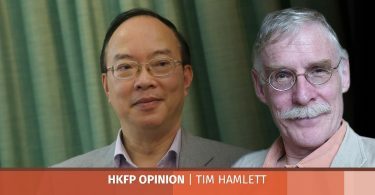 Fei, a Worker News staff member, once commented to HKFP that the domestic worker movement was “very progressive”, with a strong level of self-organisation among workers from different countries. 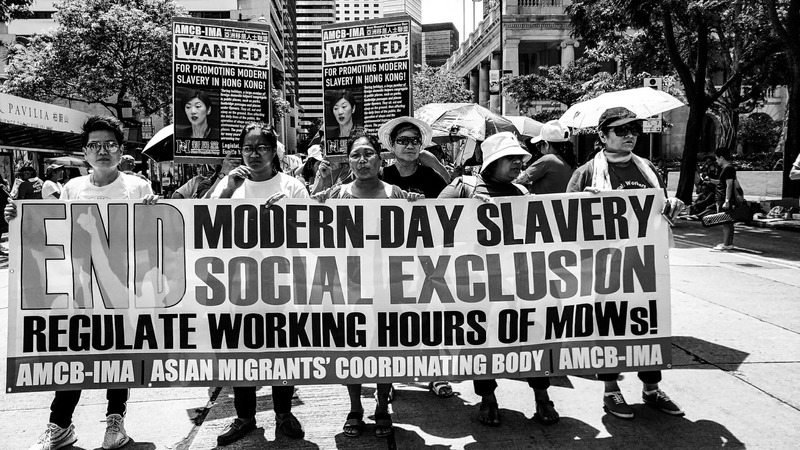 For instance, the Asian Migrants Coordinating Body is an alliance consisting of domestic workers of four nationalities: Filipino, Indonesian, Thai and Sri Lankan. 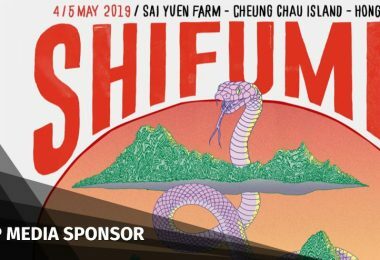 Locally, they are affiliated with the Hong Kong Confederation of Trade Unions, and they are also with the International Migrants Alliance. Yungco, who is with the Filipino Migrants Workers’ Union, fights for the “3Ws”: wage increase, working hours regulations, and workers’ rights. This is Yungco’s 21st year in Hong Kong. Yungco says she came to Hong Kong because she says there is a lack of job security in the Philippines and wages are low. But this was no reason to justify the low salary levels of domestic workers, she says. 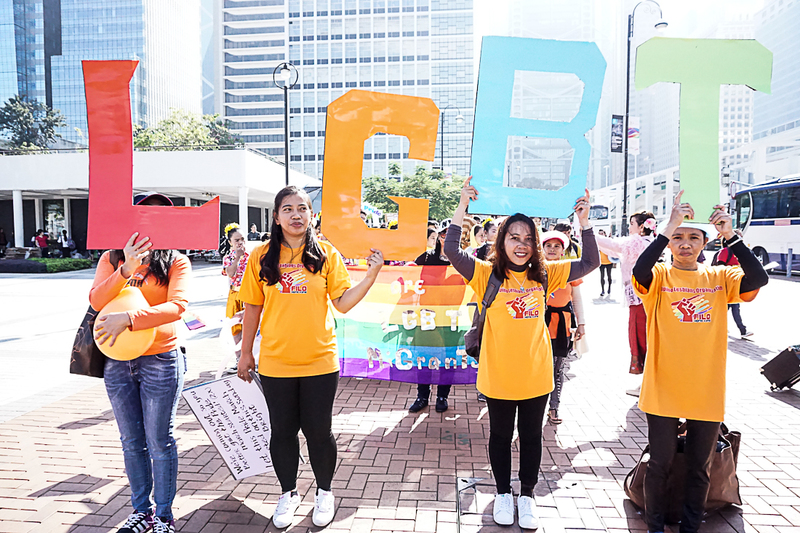 Living costs in Hong Kong are high and many employers fail to provide sufficient food; domestic workers often have to scrape by after sending the bulk of their wages back home to their families. The current minimum wage for domestic workers is HK$4,410 a month. Yungco has long been aware of the existence of migrant worker groups, but was hesitant to take part, wary because she has not experienced similar abuses and because her wages are higher than her peers. “I’m not treated like a domestic worker… I have a ‘sister’ relationship with my boss,” she says, adding that she sometimes acts as the “bridge” between the children and her employer. 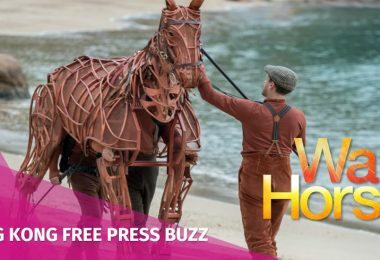 But she says even though she feels she has “nothing to gain from it” personally – she knows that there are many other migrant workers who suffer abuse. 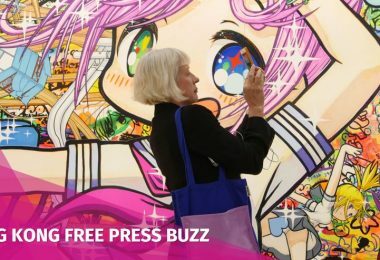 For instance, the two-week rule – which stipulates that domestic workers must find work within two weeks following the termination of their contracts, or face deportation – meant there are times when she and her employer had to “foster” her friends. Loryjean Yungco snapping pictures of her friends on Sunday. 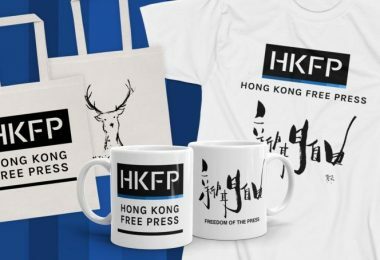 Photo: Karen Cheung/HKFP. She eventually joined one of the unions during the peak of Eriwana’s case. 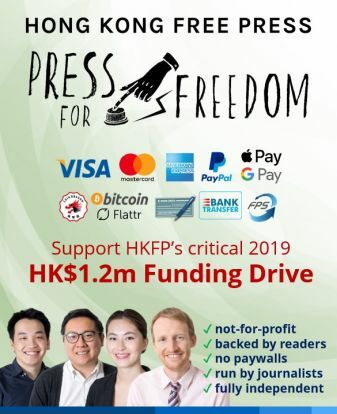 Yungco’s employer – Ms Lau – was supportive of the cause, and even donated funds to support migrant groups – in contrast with domestic workers she knew who had to sneak out on weekdays to protest, or would cover their faces at times so as not to be seen by the press. 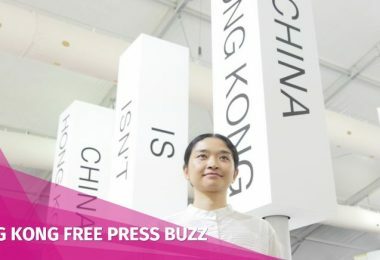 Yungco began writing for Coconuts Media, and since 2015 she has worked with photographer Adrian Lo to submit photos and articles on domestic worker protests to Hong Kong Free Press. Lo calls her an “excellent photographer” with a bubbly character. 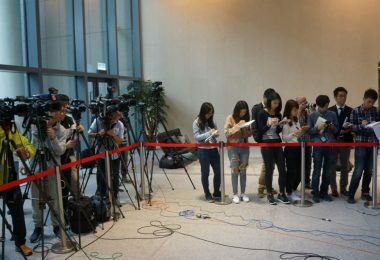 “I saw Loryjean’s powerfully emotional photographs, especially the black and white ones, so I thought it would be nice to partner up with Lory to get her pictures out in the media, and to have her unique insiders’ angle of the migrants struggles shown to Hong Kong people,” Lo told HKFP. Lo recalls that a piece Yungco wrote for Coconuts on a domestic worker rally calling for wage increase received 15,000 shares on Facebook. 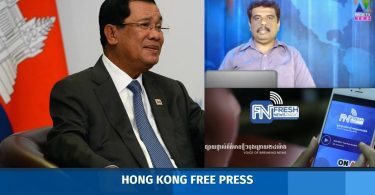 Given the highly organised movement in Hong Kong and the power of social media, he said, news spread quickly and people in the home countries of migrant workers were able to find out what was happening. 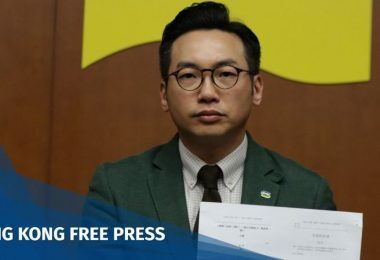 “It’s even more pertinent when domestic workers are telling their own stories, trying to get the message home, and fighting on behalf of the 300,000+ migrant workers in Hong Kong for better living conditions and more equal rights,” he added. Yungco says Lau may retire soon and they previously agreed that when that happens, it may be Yungco’s time to go too. After all, she has been away from the Philippines and her family for a long time. 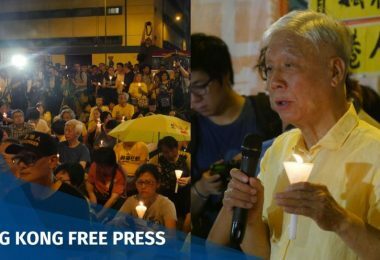 But with her involvement and dedication towards the union movement in Hong Kong, she feels she still has unfinished business. “I’m so involved in the organisation here… I’m not ready to leave,” she says.